The anterior cruciate ligament is one of the four ligaments in the knee that provides stabilization for the knee joint. Torn ACLs are a common knee injury. An ACL tear or sprain occurs with a sudden change in direction or pivot against a locked knee. A pop, followed by pain and swelling of the knee are the most common symptoms of an ACL tear. Women are more likely to tear their ACL because of differences in anatomy and muscle function. Treatment goals are to return the patient to his or her preinjury level of function. Arthroscopic surgery may be required to reconstruct the torn ligament. It may take six to nine months to return to normal activity after an ACL injury. 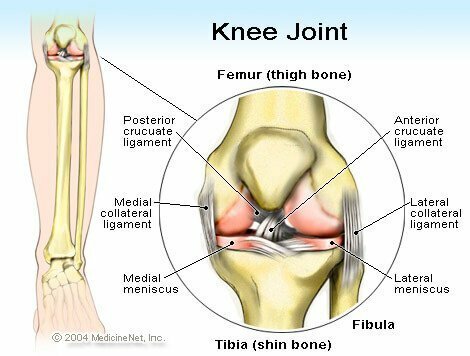 What is the function of the knee joint? The purpose of the knee joint is to bend and straighten (flex and extend), allowing the body to change positions. The ability to bend at the knee makes activities likewalking, running, jumping, standing, and sitting much easier and more efficient. The thighbone (femur) and the shinbone (tibia) meet the kneecap (patella) to form the knee joint. The rounded ends of the femur, or condyles, line up with the flat tops of the tibia called the plateaus. There are a variety of structures that hold the knee joint stable and allow the condyles and plateaus to maintain their anatomic relationship so that the knee can glide easily through its range of motion. The knee is a hinge joint, but there is also some rotation that occurs when it bends and straightens. There are four thick bands of tissue, called ligaments, that stabilize the knee and keep its movement in one plane. The medial collateral ligament (MCL) and the lateral collateral ligament (LCL) stabilize the sides of the knee preventing side-to-side buckling. The anterior cruciate ligament (ACL) and the posterior cruciate ligament (PCL) form an X on the inside of the knee joint and prevent the knee from sliding back to front and front to back respectively. The major muscles of the thigh also act as stabilizers: the quadriceps in the front of the leg and the hamstrings in the back. A sprain occurs when a ligament is injured and the fibers are either stretched or torn. A first-degree sprain is a ligament that is stretched but with no fibers torn, while a second-degree sprain is a partially torn ligament. A third-degree sprain is a completely torn ligament. What is a torn anterior cruciate ligament (ACL)? What are symptoms and signs of a torn ACL? Televised sporting events have allowed the general public to watch how knee injuries occur, often repeatedly in slow-motion replay. What is the treatment for a torn ACL? Is surgery needed to repair an ACL tear? The major decision in treating a torn ACL is whether the patient would benefit from surgery to repair the injury. The surgeon and the patient need to discuss the level of activity that was present before the injury, what the patient expects to do after the injury has healed, the general health of the patient, and whether the patient is willing to undertake the significant physical therapy and rehabilitation required after an operation. Nonsurgical treatment may be appropriate for patients who are less active, do not participate in activities that require running, jumping, or pivoting, and who would be interested in physical therapy to return range of motion and strength to match the uninjured leg. Surgical repair is recommended for those who wish to return to Level I and II activities. This is generally not an emergency and is undertaken after a understanding all treatment options. Young athletes may require surgical repair of the ACL because of the potential for knee instability and inability to return to their level of competition. A nonsurgical approach might be considered for patients who have level III and level IV lifestyles. Those who are candidates for nonoperative treatment benefit from physical therapy and exercise rehabilitation to return strength to the leg and range of motion to the injured knee. Even then, some patients might benefit from arthroscopic surgery to address associated cartilage damage and to debride or trim arthritic bony changes within the knee. Recovery from this type of arthroscopic surgery is measured in weeks, not months. If surgery is planned, there is usually a waiting period of a few weeks after the injury so that pre-habilitation can occur to strengthen the muscles that surround the knee. The waiting period also decreases the risk of developing excess scar formation around the knee (arthrofibrosis) that might restrict knee motion after the operation. Surgery is usually planned to occur within five months of injury. The anterior cruciate ligament can be reconstructed by an orthopedic surgeon using arthroscopic surgery. There are a variety of techniques, depending on the type of tear and what other injuries may be associated. The decision as to what surgical option is appropriate is individualized and tailored to a patient’s specific situation. Because of its blood supply and other technical factors, the torn ACL ends are not usually sewn together and instead, a graft is used to replace the ACL. Often an autograft, tissue taken from the patient’s own body, is a piece of hamstring or patellar tendon that is used to reconstruct the ACL. Rehabilitation physical therapy and exercise program is often suggested to strengthen the quadriceps and hamstrings before surgery. It may take six to nine months to return to full activity after surgery to reconstruct an ACL injury. The first three weeks concentrate on gradually increasing knee range of motion in a controlled way. The new ligament needs time to heal and care is taken not to rip the graft. The goal is to have the knee capable of being fully extended and flexing to 90 degrees. By week six, the knee should have full range of motion and a stationary bicycle or stair-climber can be used to maintain range of motion and begin strengthening exercises of the surrounding muscles. The next four to six months is used to restore knee function to what it was before the injury. Strength, agility, and the ability to recognize the position of the knee are increased under the guidance of the physical therapist and surgeon. There is a balance between exercising too hard and not doing enough to rehabilitate the knee and the team approach of patient and therapist is useful. The diagnosis of an ACL tear may be made by emergency physicians, primary-care providers, sports-medicine providers, and/or orthopedic surgeons. Once the diagnosis is made, referral is often made to an orthopedic surgeon who would discuss the potential risks and benefits of surgery and other options. The orthopedic specialist would be the one to perform the surgery. After the operation, a physical therapist under the direction of the orthopedic surgeon, would work with the patient to return them to normal activity. If no surgery is planned, the primary-care provider or the orthopedic surgeon could direct care in association with a physical therapist. Anti-inflammatory medications, such as ibuprofen (Motrin, Advil), naproxen (Aleve), or ketorolac (Toradol), may be suggested to decrease swelling and pain. Narcotic medications for pain, such as codeine, hydrocodone (Vicodin,Lortab), or oxycodone (Percodan, Percocet), may be prescribed for a short period of time after the acute injury and again after surgery. How long does it take to recover from a torn ACL? Rehabilitation and return to normal function after surgical repair of an ACL tear can take six to nine months. There needs to be a balance between trying to do too much work in physical therapy returning strength and range of motion and doing too little. Being too aggressive can damage the surgical repair and cause the ligament to fail again. Too little work lengthens the time to return to normal activities. What is the prognosis of a torn ACL? Most people who have surgery to repair their ACL have good return of function and lifestyle. Long-term success rates are reported between 82%-95%. Fewer patients develop permanent knee instability. Up to 8% develop graft failure or instability. For patients who do not have surgery to repair a torn ACL, only half have a fair outcome with no knee instability. This is an option for sedentary people or for those whose activities require no pivoting or cutting. Is it possible to prevent ACL tears? ACL injuries usually occur in active people engaged in activities that are enjoyable. The risk of injury can potentially be decreased by maintaining muscle strength and flexibility. Warming up, stretching, and cooling down are ways of protecting joints and muscles. Wearing braces to prevent injury may or may not be useful. Strengthening exercises and agility drills can help prevent injury. Plyometric exercises to help build power, strength, speed, and balance can teach the body how to jump and land properly to minimize the risk of injury, especially in women. It is important to avoid landing on a fully extended and locked leg.